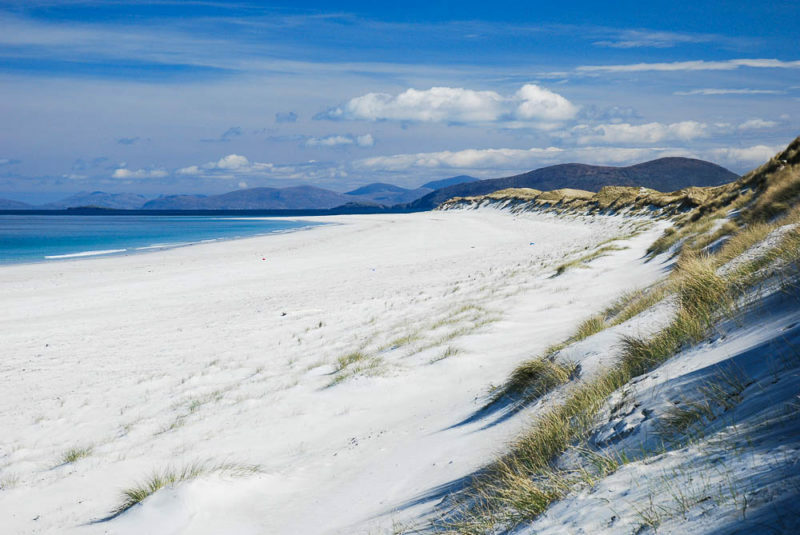 We’ve previously posted our pick of the most beautiful beaches in the West Highlands. Now we board the ferries to visit Scotland’s stunning islands on a journey through the Hebrides, Orkney and Shetland – blessed with some of the very finest beaches in the world. 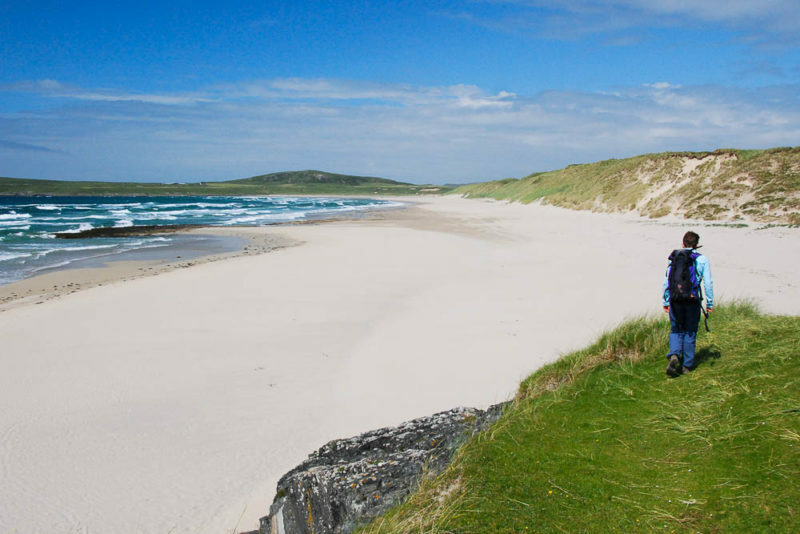 Check out also our guide to the best of Scotland’s east coast beaches. 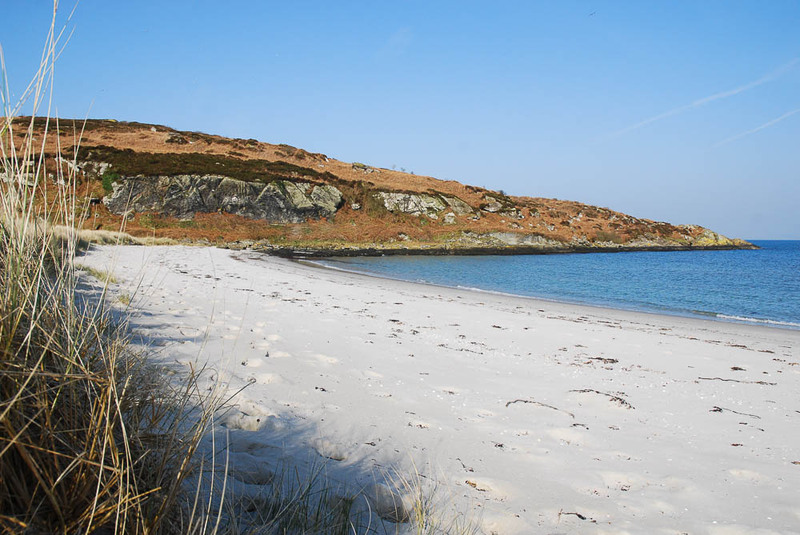 Set off the Kintyre peninsula, Gigha is an island that really deserves to be better known. It has several excellent beaches, but the pick of them has to be Bagh na Doirlinnhe in the north, where twin beaches line either side of a tombolo linking to Eilean Garbh. Islay is known as the Queen of the Hebrides and this fertile island is revered by lovers of peaty whisky as a mecca. But its no slouch when it comes to sandy beaches either, with a good number of simply superb sandy beaches. Beautiful Machir Bay (Traigh Mhachir) on the Rhinns of Islay peninsula is many people’s choice of the finest, more than a mile of fine sand backed by extensive dunes (and less than a mile from a distillery!). 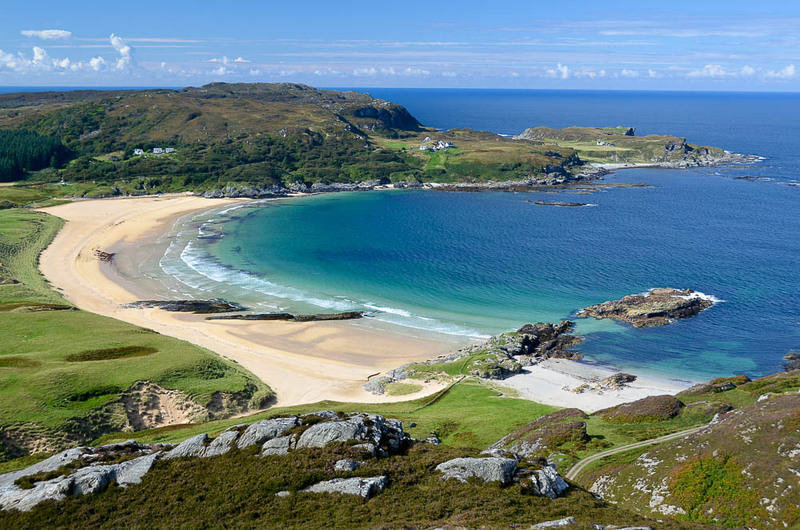 Colonsay is one of the more isolated of the Hebrides, set behind Islay and Jura, but the island greatly rewards those who make the effort to get there. It has some wonderful beaches, with Kiloran Bay being perhaps justly the best known. Don’t miss the walk out to the remote Traigh Ban near the northern tip of the island too. The most westerley of the Inner Hebrides, Tiree is famed for both its perfect sandy beaches – of which it has many – and for its mild climate and good sunshine record. But how to choose from all those wonderful beaches? We’ve selected Traigh Throdhrasdail on the west coast, but all lucky enough to visit the island probably have their own personal favourites. Coll is Tiree’s near neighbour and a twin in size, though the island has a very different, more rugged character. 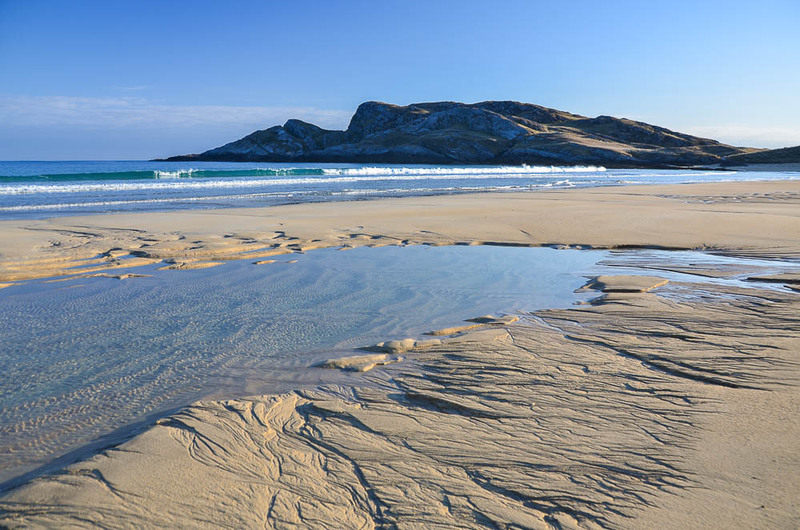 The one thing it does have in common with Tiree is the quality of its beaches though, ranging from small, scarcely-visited coves of perfect sand to the majestic Feall and Crossapol Bays which almost meet at the southwestern end of the island. The Small Isles are many people’s favourite Scottish islands, each with its own, very distinctive features. 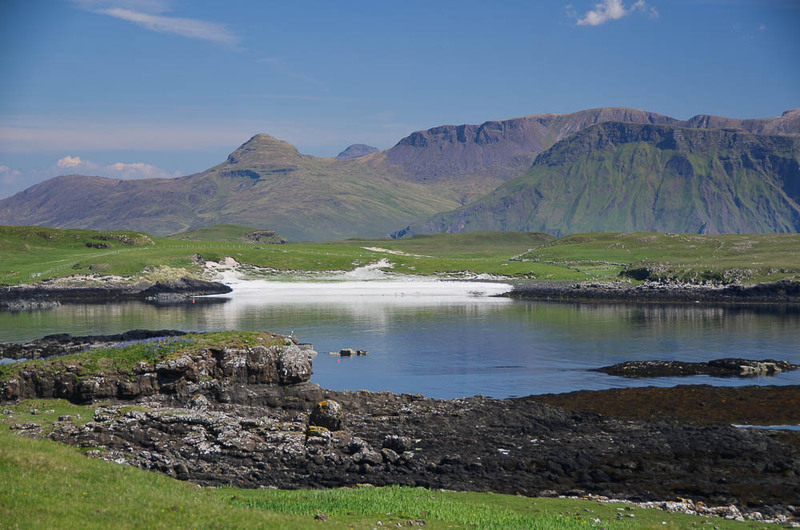 Rum has beautiful Kilmory Bay, Muck has Gallanach with its fine views and Eigg has the Singing Sands and Laig Bay overlooking the Cuillin of Rum. But how many people have been to this fabulous beach on Sanday lying just west of the causeway linking to Canna? Mull is one of the best known of the Hebrides, and its best known beaches are probably Calgary Bay in the north, and the beaches on Iona. There are other sandy bays which remain unknown to most and discovering them is a joy – our pick here is Kilvicheon Bay south of Bunessan. 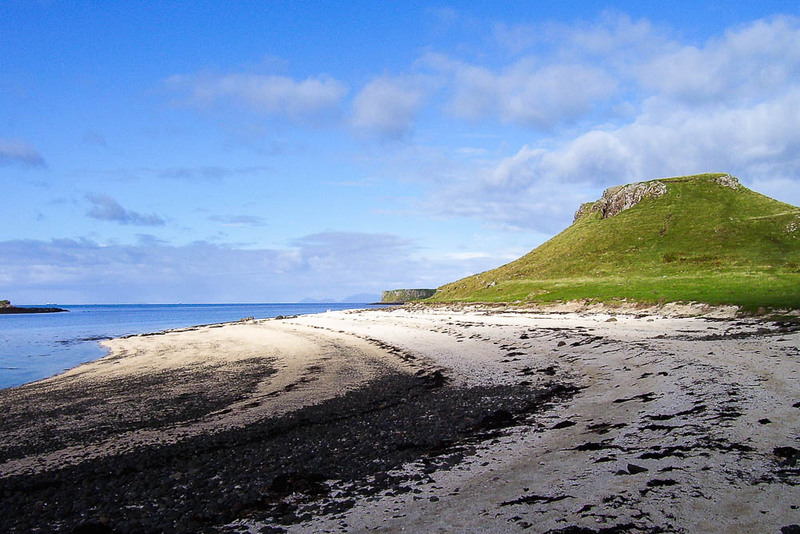 The Isle of Skye is renowned for its iconic and majestic landscapes… but not for its sandy beaches. However, it does have several beaches worthy of a mention, from Camas Daraich in on the walk out to the Point of Sleat in the southwest, to Staffin Bay in the northeast. Perhaps the finest though are dramatic Talisker Bay with its sea stacks and waterfalls, and the gleamining white Coral Beach near Claigan north of Dunvegan – its sand made up of dried,calcified sea weed known as maerl. We move now across to the Outer Hebrides. 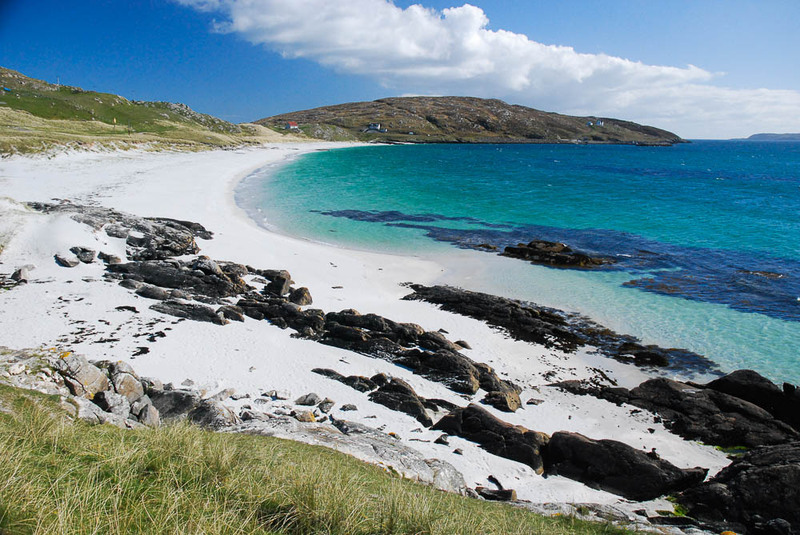 The incomparable Isle of Barra at the southern end of the chain has some superb beaches, with those on Vatersay (to which it is connected by a causeway) being of special note. Our choice though is Halaman Bay – on the west coast but not far from the capital, Castlebay. 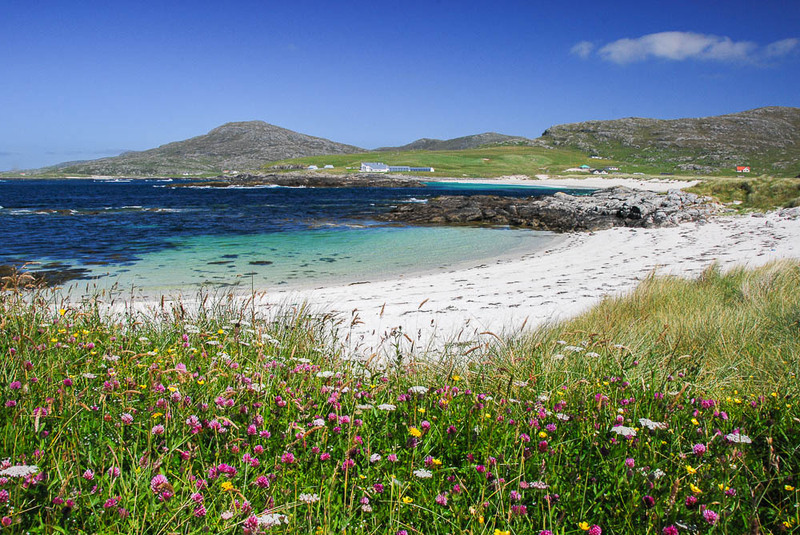 The perfect sand here is backed by a fine sweep of machair – bedecked with wild flowers in early summer. 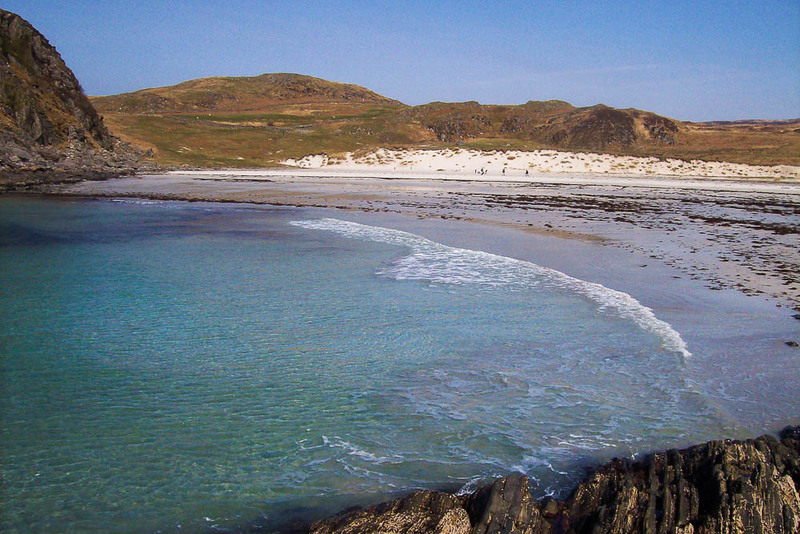 Huge sandy beaches stretch almost the entire length of the west coast of South Uist – a distance of over 30km. But it is the neighbouring small island of Eriskay that we’ve picked out, for Coilleag a’ Phrionnsa. This is a beach whose history matches its beauty, as it was the first landing place in Scotland for Bonnie Prince Charlie at the start of the second Jacobite rebellion, as well as being a central location in the real-life story of shipwrecked whisky made famous by Compton MacKenzie in Whisky Galore. North Uist is an island where waterscapes dominate over landscapes, but it is fringed by some majestic sands. Traigh Hornais – commonly known as Clachan Sands – is hard to beat with its perfect curve backed by the dunes. Berneray’s West Beach is one of the truly spectacular sweeps of sand, stretching for over 5km of perfection. 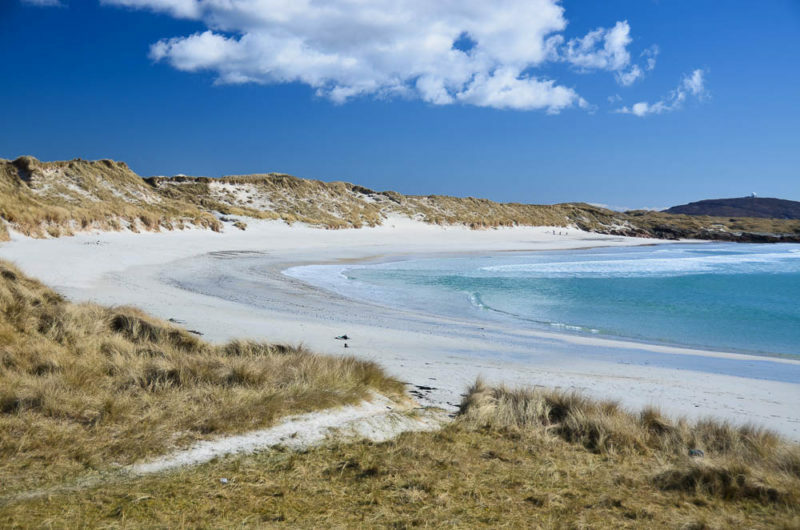 Not many of us would get the Outer Hebrides too confused with Thailand, but it seems the Thai tourist authorities were jealous of the beauty of Berneray – they used a photo of the Scottish beach to promote holidays in one of their own marine National Parks. 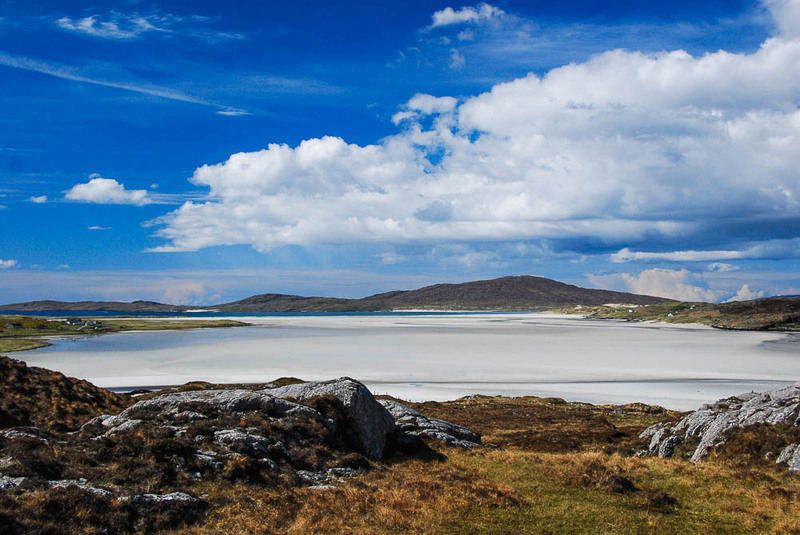 Most people asked about beaches on Scottish islands probably think of the Isle of Harris. 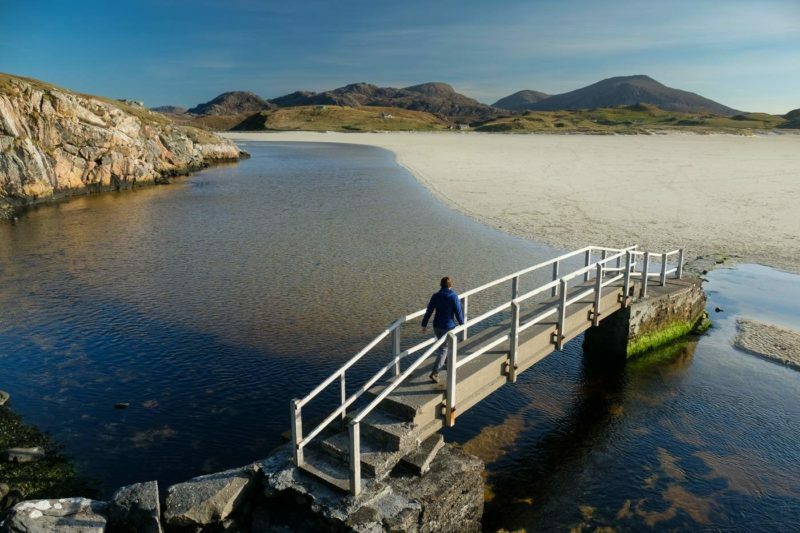 With good reason – as Harris has simply stunning beaches aplenty. Scarasta is majestic and Traigh Iar is more intimate but sublime, Huisnish feels wilder and more remote and our secret favourite is the little-visited beach at the ruined chapel below Ceapabhal, but such is the deserved fame of the Luskentyre Sands that we simply had to make it our choice for the island. Lewis is really the same island as Harris, the communities once having been divided by their mountains but now linked by road. 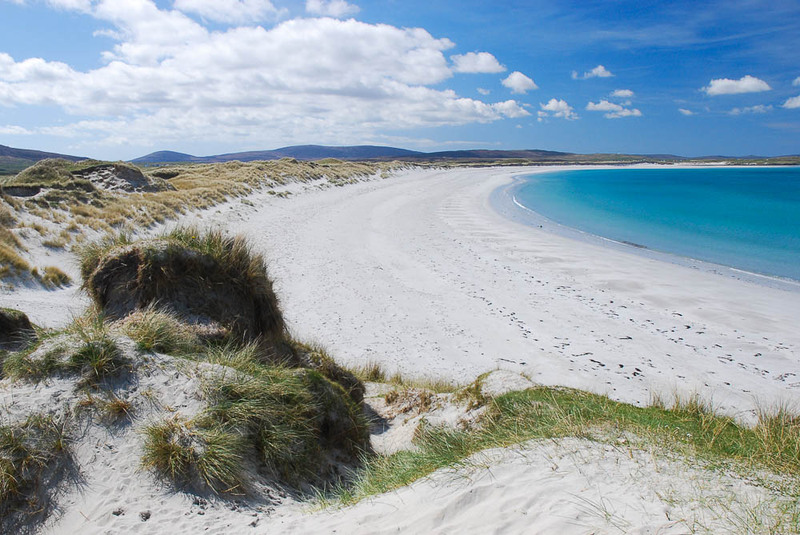 The most populated of the Hebrides has beaches that can match anything elsewhere. The stunning sweep of sands at Uig on the west coast are perhaps the most celebrated – it was here that the famous Lewis chessmen were found. For the next choice we leap more than 200km east and north to Orkney. The archipelago here is perhaps most famous for its prehistoric and archaelogical remains, but the more remote northern islands in particular have some fine beaches. 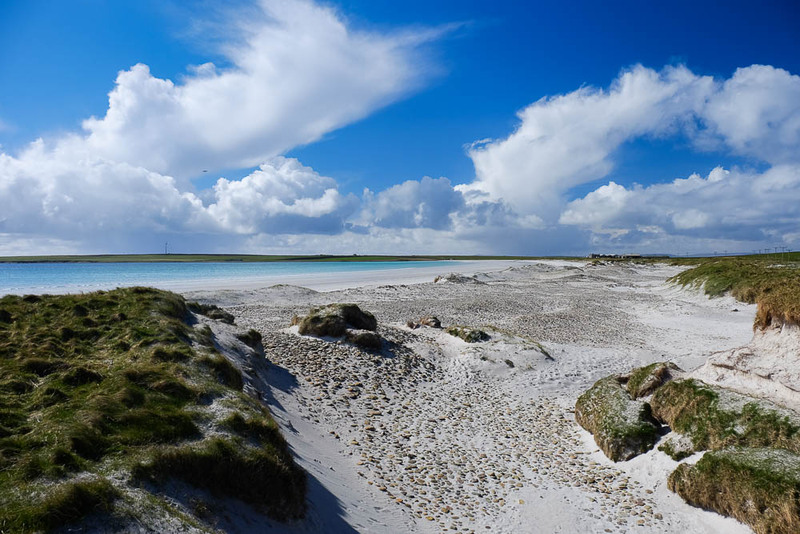 Westray and – especially – Sanday are blessed with fine sands, but our pick is the Sand of Rothiesholm, one of two majestic beaches on the island of Stronsay. Heading further north still, Shetland has some of the very finest island beaches. Unst and Yell have some superb, little visited bays of perfect sand, whereas Banna Min on West Burra is a real gem. 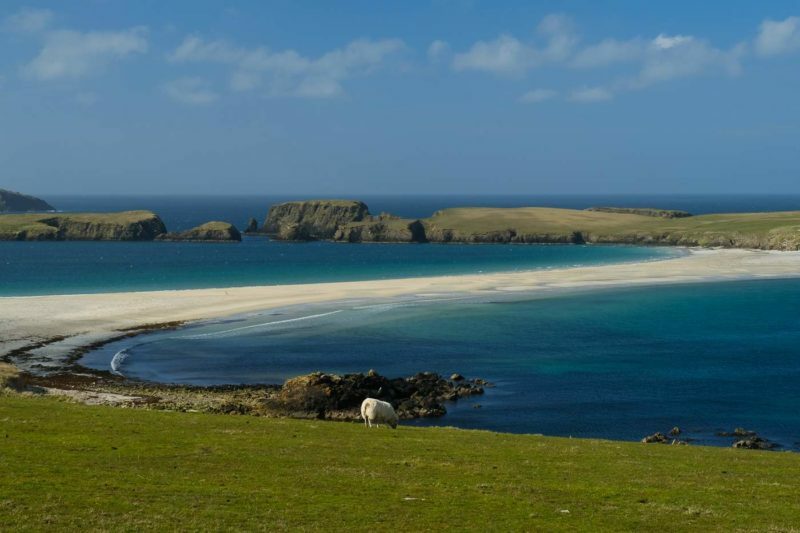 But it is the sand tombolo that links Mainland with St Ninian’s Isle that takes pride of place – and is our final pick.